There are more and more interesting videos and movies on the internet. Do you want to also enjoy these videos on your PSP, iPad, iPhone, or any other multimedia devices? For example, as long as you want to watch videos with FLV format on iPhone, you have to convert FLV to MP4. Xilisoft FLV Converter is a simple-to-use FLV video converter to convert .flv to .mp4. Except for converting FLV to MP4, it can also convert FLV to MPEG, AVI, WMV, DivX, MOV, etc. video formats easily. 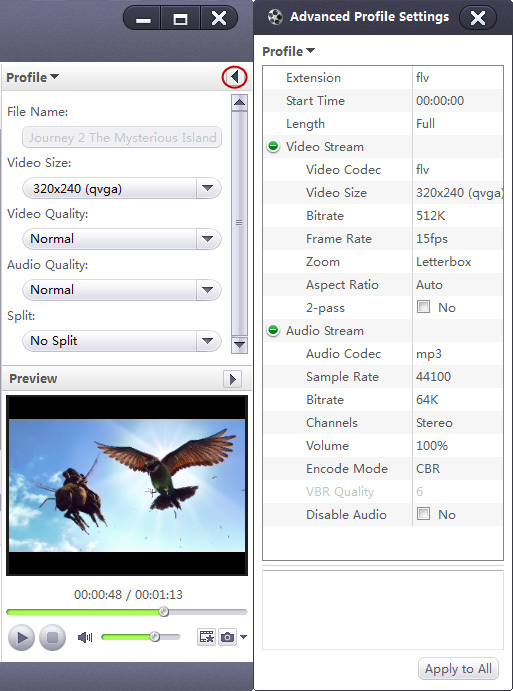 With it, you can even convert AVI, MPEG, WMV, MP4 video to FLV file with super fast speed. Click "Add File(s)" button to load your FLV files. Choose the file you want to convert, click "Profile" drop-down button to choose MP4 - MPEG-4 Video (*.mp4) as your output format, then click "Browse" button to choose destination folder for saving your converted MP4 files. After choosing the profile, you can adjust parameters by clicking the "Advanced Profile Settings" button. Step 4: Start to convert FLV to MP4. If you're interested in this FLV to MP4 converter program, please visit: Xilisoft FLV Converter. Free download trial is also available. How to convert SWF to MP4 at fast speed?